Well, a few remaining Republicans in Sacramento managed to get an audit done. The price tag is up to 77 billion dollars. Pushing to break ground on California's high-speed rail project before critical planning for the Central Valley line was in place drove up its cost by $600 million, with that "flawed decision" potentially increasing the price tag by another $1 billion, state Auditor Elaine Howle said Thursday. And more financial problems are looming for high-speed rail. . . . I seem to have heard this story before. The audit released Thursday was done at the request of the Joint Legislative Audit Committee. Assemblyman Jim Patterson, R-Fresno, a critic of the rail project, said the report shows that high-speed rail is "dead in the water." "There will never be a completed track from the Bay Area to Los Angeles," Patterson said. "This project cannot be revived in its current state, and this audit is further proof that the best we can hope for is a rump railroad running from Bakersfield to Madera." This "rump railroad" would run near many of the prisons in California. So it could carry a lot of long-distance commuting prison staff and/or people visiting prisons. Subsidized, of course. A bullet train making stops in tiny Corcoran would change the town some. The auditor's report comes as the project's biggest champion, Gov. Jerry Brown, prepares to leave office in the coming weeks. 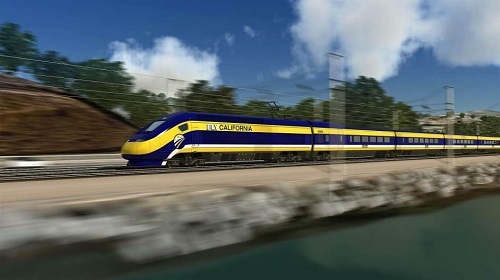 Gov.-elect Gavin Newsom has been less enthusiastic about high-speed rail than Brown, saying he would focus on completing the portion from the San Joaquin Valley to the Bay Area before deciding whether to make a push to Los Angeles. Better idea: Just leave the impressive support columns already constructed up as a monument to governmental dreams that didn't pan out, and use the money to fix the highways. Maybe do a regular rail line over the Grapevine. Remember that even if they finish this thing, it will no longer be High Speed. FLY California? Nope. Got a government boondoggle in process near you? Incidentally, late ballots sure put a lot of Democrats over the top in California this year. In both national and state races. The Camp Fire in Northern California is out. A lot of harrowing stories came out of that fire. And Gerard Van der Leun has an understated, image-filled Thanksgiving post that you may find memorable. May bring a tear or two. I think some of his other posts about the fire are memorable, too. Neo put up a post on The Great Fires and the forgetting. One of the earliest posts I ever wrote on this blog (in January 2005) was called "The tsunami and the forgetting". It was about the phenomenon of people forgetting--and certainly forgetting the details of--huge and terrible disasters, even recent ones. . . I thought of that post again in the wake of the Camp Fire that tragically and horrifyingly has taken so many lives, although the number is of course dwarfed by those previous tolls. .
And then I was surprised to read a headline saying that the Camp Fire was the worst since 1918, when the Cloquet Fire in Minnesota caused 453 known deaths (there may have been many more), destroyed 38 communities, and displaced or injured over fifty thousand people. And until yesterday I'd never even heard of the Cloquet Fire. Had you? Maybe if you live in Minnesota you have, but has anyone else? "So it is in this; you, who are the father of writing, have out of fondness for your off-spring attributed to it quite the opposite of its real function. Those who acquire it will cease to exercise their memory and become forgetful; they will rely on writing to bring things to their remembrance by external signs instead of by their own internal resources. What you have discovered is a receipt for recollection, not for memory. And as for wisdom, your pupils will have the reputation for it without the reality: they will receive a quantity of information without proper instruction, and in consequence be thought very knowledgeable when they are for the most part quite ignorant. And because they are filled with the conceit of wisdom instead of real wisdom they will be a burden to society." I think Ben Rhodes was unconsciously channeling Plato when he described journalists. . . . I thought the observation that we remember disasters about which there is a song or movie was interesting. In the Thursday Morning Report, our own J.J. Sefton picked up a summary at Legal Insurrection derived from a piece on activist women who claim that Trump's election destroyed, or is destroying, their marriages. Usually marriages to other lefties. Is there anything Trump can't do? . . . .
“Samantha and John” from NYC are having issues because John doesn’t hate Trump near as much as Samantha . . . .
David Thompson takes a slightly different tack on the same piece, having the audacity to label the women whom the New York Magazine took seriously as "unstable leftist women". Special attention is given to a woman who developed a relationship with, then married, a Republican man for revenge. But according to her, The Orange Man wrecked her marriage. Well, enough of that. Got anything nice planned for the weekend? Hope yours turns out well.